When the Eurasia Group recently published its 2013 Top Risks Report, it drew a fascinating but questionable conclusion: “The world’s advanced industrialized democracies are much more resilient than feared.” Eurasia Group even went so far as to suggest that developed economies had demonstrated “anti-fragility” in their recovery from the financial crisis of 2007-2008. That is to say, the economies and political systems of the developed world were actually strengthened in the wake of the crisis. Any such view minimizes the continuing severe political-economic risks faced by developed economies such as those in Europe, the US, and Japan. Debt, the fuel that stoked the fires of the 2007-2008 financial crises, is as prevalent as ever, and has reached unprecedented levels in most developed nations. Perhaps the most obvious case of an unrepaired sovereign balance sheet is Japan, whose current statues could drag the global economy back into recession. To make matters worse, the policy goals of the new Prime Minister, Shinzo Abe, have only increased the odds of this occurring. Much like his western counter-parts in the US and EU, Mr. Abe believes it is time for the Bank of Japan to engage in a more aggressive monetary policy. Although the experimental monetary policies of the US and the EU, with their massive injections of liquidity into the credit markets, have been credited with staving off disaster post 2007-2008, the long-term effects and consequences of such actions are unknown, especially in an economy already as leveraged as Japan’s. Combined with the consequences of an aging Japanese population, such measures may create more problems than they solve. At the heart of Japan’s problem is its current debt levels, which are running at approximately 230% of GDP. This debt has been financed through the issuance of low interest rate government bonds (the Japanese 10 year note currently carries an interest rate of less then 1%, the lowest in the world). The primary market for these bonds has been the domestic consumer, most especially Japanese households. Today, approximately 93% of Japanese government debt is domestically held. At issue is the fact that there are two factors that are likely to lead to a decline in domestic consumption of government debt. First Japanese households, which have historically had a very high savings rate, are now saving less then 2% of their income; as savings rates decline, so to will the ability of domestic consumers to buy government debt. Second, the Japanese current account surplus has also dwindled from approximately 6% of GDP in 2007 to less then 1%. The current account surplus has been essential for the Japanese government, as it results in new money entering the economy. The new money, when levered in the banking system, has been key to maintaining high rates of domestic consumption of government debt. There is also the greying of the Japanese population to contend with, which will exacerbate government debt problems. The share of the Japanese population that is over retirement age of 65 has more than doubled over the past two decades. As this share grows not only will it consume a larger portion of the Japanese governments expenditures in the form of social programs, but those over 65 will also contribute less in taxes to government coffers. Even before a decrease, domestic taxes cover less than half of Japanese government expenditures and, according to Kyle Bass of Hayman Capital Management, approximately 50% of tax revenue is used to service current debt. 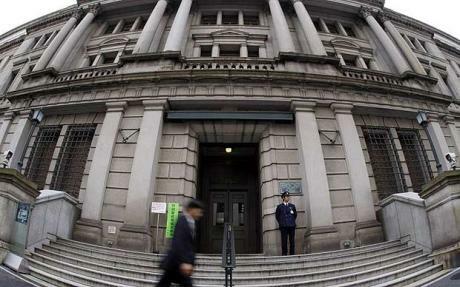 If Mr. Abe achieves his monetary and fiscal policy goals, and the current account surplus continues to dwindle, Japan will have to rely on foreign investors to take up the slack. When this happens, foreign investors will demand a higher interest rate from Japanese government debt. Should this occur, the Japanese government’s ability to pay its debt will be called in to question. Martin Feldstein of Harvard University suggests that a 4% rise in borrowing cost would likely double the annual deficit. Kyle Bass has an equally negative view, and suggested recently on CNBC that every 1% move in interest rates costs the Japanese government a further 25% of government revenue. Moves of 100, 200 or even 400 basis points may seem far-fetched given that the ten year Japanese Government Bond currently trades at 0.73%, but 10-Year Japanese Government Bonds traded at 1.73% just five years ago and at 4.87% twenty years ago. Barring a dramatic reversal of fortunate, it seems Japan is rushing headfirst towards a tipping point that would likely leave it bruised and battered. Resilient, let alone “anti-fragile”, appears an inappropriate descriptor for Japan’s current situation. To suggest that US and European economies, which appear on a fiscal path not dissimilar to Japan’s, are also resilient is a position that lacks a firm footing. If the governments of developed nations do not address profligate spending quickly, it is only a matter of time before market forces discipline them. William Thomson is currently a graduate student at Harvard University where his research focuses on political risk for multinationals, specifically firms involved in extractive industries in Asia. He previously served as a Strategic Advisor to NATO in Afghanistan assisting with counter-corruption and economic development issues. His writings have appeared in The Diplomat as well as the Small Wars Journal.